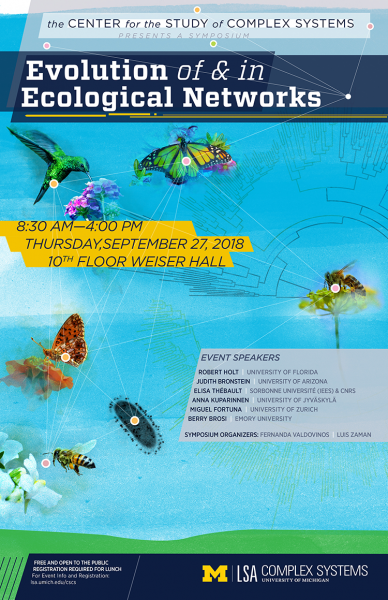 9:00-9:55 am ROBERT HOLT - University of Florida "On the interplay of niche conservatism, evolutionary rescue, and trophic interactions: Edging towards networks"
9:55-10:50 am ANNA KUPARINNEN - University of Jyvãskylã "Harvest-driven evolution in aquatic food webs"
11:05-12:00 pm MIGUEL FORTUNA - University of Zurich "Coevolutionary dynamics shape the structure of bacteria-phage infection networks"
1:00-1:55 pm ELISA THÉBAULT - Sorbonne Université (IEES) & CNRS "The structure and dynamics of mutualistic and antagonistic networks"
1:55-2:50 pm BERRY BROSI - Emory University "Stability in ecological networks: guilds and interactions between topological and quantitative structure"
3:05-4:00pm JUDITH BRONSTEIN - University of Arizona "What constitutes "mutualism" within mutualistic networks?" Registration Link Below. Lunch Registration closes Tuesday, September 25 at 10am.